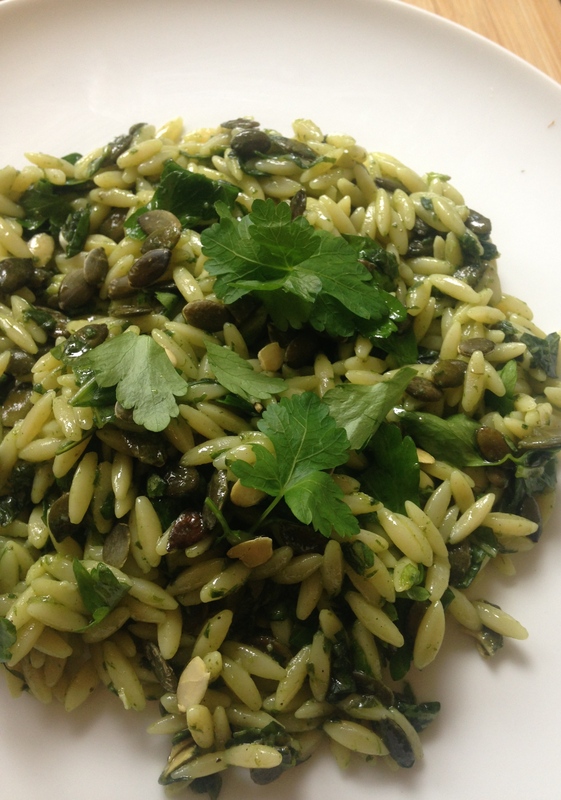 I’ve been really enjoying using orzo pasta recently, it’s a bit different to the standard pasta and pesto but not quite as rich as a risotto. It’s satisfying but light which makes it perfect for a pasta salad. This one is great for taking to uni, simple to make and has interesting textures which makes it filling for a long day of lectures. I’ve made a kind of cheat’s pesto for this salad, just basil, garlic and extra virgin olive oil (which makes it vegan too!) which I think makes it a little lighter and allows the pumpkin seeds to have more punch. I’ve packed up my pasta for tomorrow with a few roasted tomatoes and red peppers, so delicious! Start by cooking the orzo pasta according to packet instructions until soft but not too squashy, you want it to hold it’s shape when cold. While the pasta is cooking, tear up the basil and put into a blender/processor/liquidizer and cover with the olive oil. Add the garlic cloves, salt and pepper and blitz until the basil has broken down. Spread the pumpkin seeds out in an even layer on a baking tray and toast in a 200 degree oven for 5 minutes. 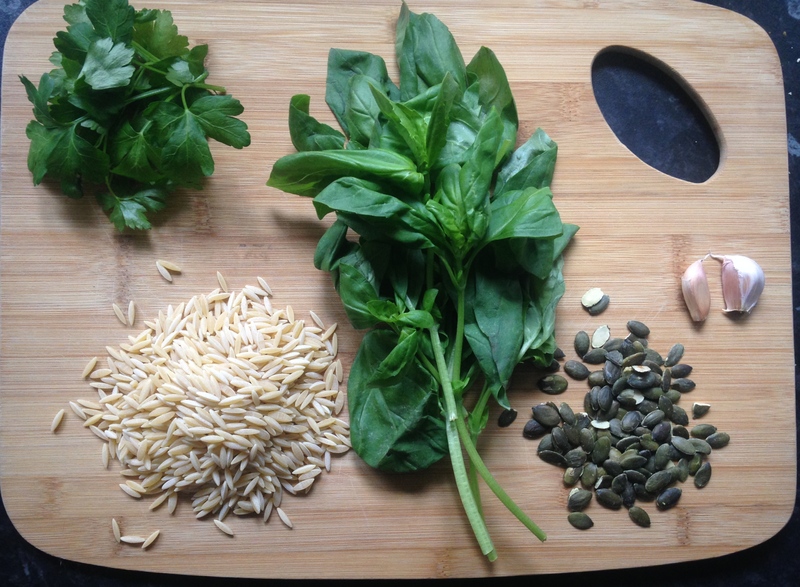 Once the pasta is cooked, add the pesto-mix, seeds and some fresh parsley. Add salt to taste and you’re done! Really simple and tasty, let me know if you have a go at this I would love to see/hear about it!